is a fifth generation family business, serving Brighton & Hove and the surrounding areas. 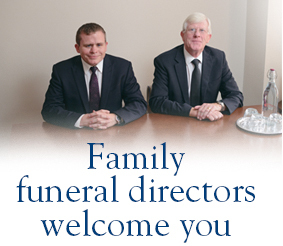 Bungard Funeral Directors provides emotional support, expert advice and practical help during your time of sadness. We are an independent, fifth generation family business dedicated to serving the communities of Brighton, Hove, Portslade, Patcham, Southwick, Lancing, Shoreham, Worthing and surrounding areas in Sussex with a professional, respectful and personal funeral service. Being a funeral director is not just a job to us, it’s a vocation. We have been supporting the bereaved in our community for over 106 years. Our role is to help you through a very difficult time, coping with the extreme emotions that bereavement brings, such as grief, bewilderment, indecision and anger. On a practical level, we take care of everything you need, from notices in the paper and flowers to the headstone and post funeral arrangements. Bungard Funeral Directors creates bespoke services that allow you to say goodbye to your loved one in a personal way. We ensure everything from the music to the coffin form a fitting and unique tribute to the deceased and provide you with some comfort on the day of the funeral. We cater for all religions and beliefs as well as organising both traditional and modern funeral arrangements. Our services are flexible to your needs, from the funeral transport to your payment options. Bungard Funeral Directors maintains high standards in all areas of the business, from ongoing staff training to the upkeep of our vehicles. As a family firm, we carry our own values through everything we do. Customers can visit us at our offices or in their own home – whatever is more convenient; we are on call 24 hours a day. Our fully equipped office in Hove is conveniently located on Sackville Road and includes a chapel of rest. If you want to prevent your family having to organise your funeral, Bungard Funeral Directors also specialises in arranging pre-paid and pre-planned funerals. Find out about our after funeral care.